Are you looking for a yacht rental San Diego? 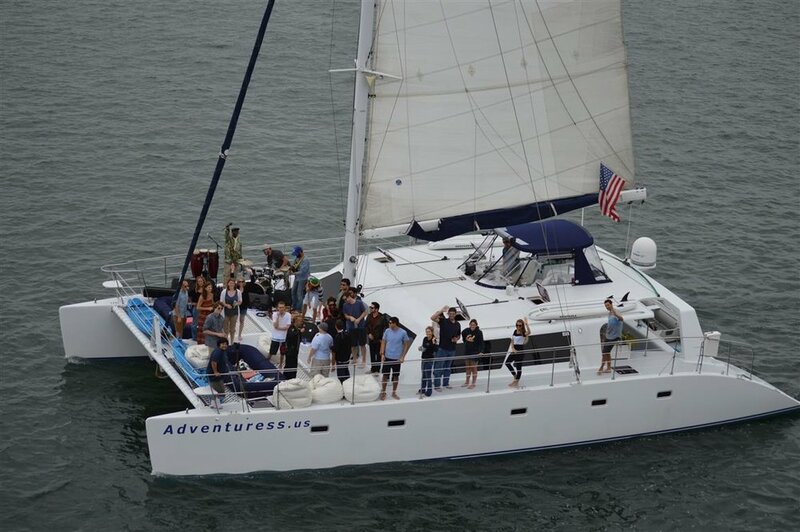 The Adventuress is a gorgeous 60 foot sailing catamaran available exclusively for yacht tours in San Diego. The Adventuress is Coast Guard certified and can accommodate up to 48 guests, and readily available for private charter in San Diego. Are you looking for a yacht rental San Diego? 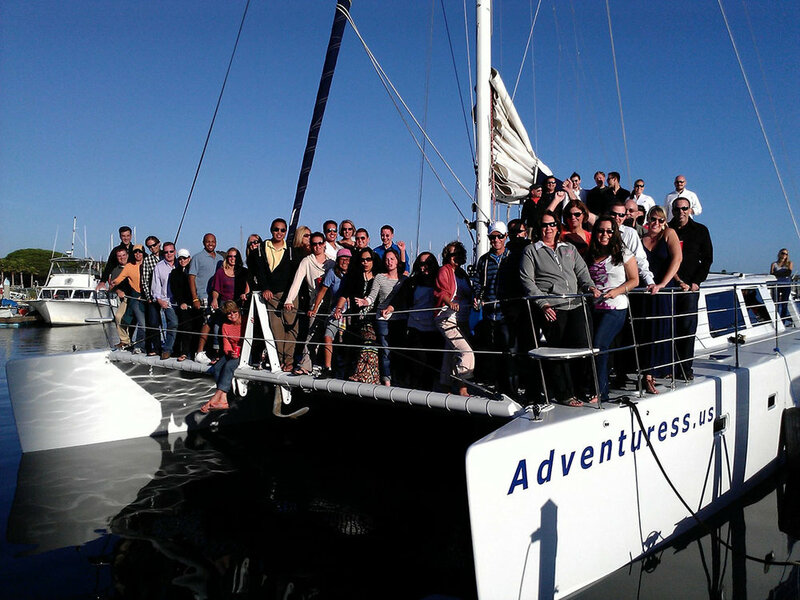 The Adventuress is a gorgeous 60 foot sailing catamaran available exclusively for private yacht charters in San Diego. The Adventuress is Coast Guard certified and can accommodate up to 48 guests, and readily available for private charters, parties, tours, whale watching and anything you’re looking for in San Diego. Custom built as a charter yacht, the Adventuress has a beautiful teak wood main salon, 75 bottle wine locker, flat screen TV with satellite service, spacious outdoor decks, and covered aft cockpit. Her beautiful teak interior and spacious outdoor decks are sure to impress. At 60 feet in length and 32 feet wide, the Adventuress has more deck space than most 100 foot yachts. Her wide beam also makes her very stable and comfortable while at sea. In addition to nearly 2,000 square feet of sail area, the Adventuress also has twin 200HP turbo engines. 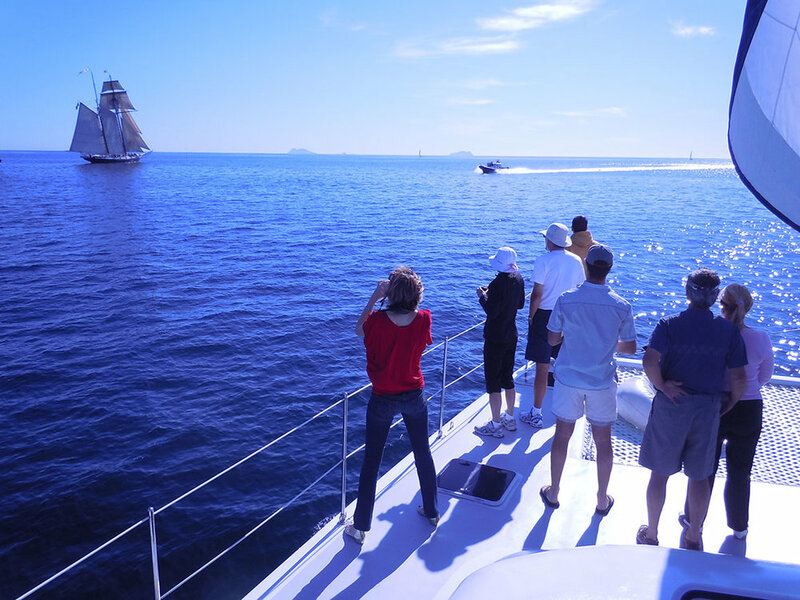 So, whether under sail or under power, our yacht charter San Diego is faster than most power yachts her size. Our Captain and crew pride themselves on providing first class service, and will ensure that you and your guests have an amazing and memorable experience. Plus, no matter when you choose to go catamaran sailing in San Diego, you’ll be surrounded by a world of pure luxury. Think teak interiors, panoramic views and some of the best amenities you’ll find.The Adventuress is like the condo of your dreams right here on the water, and you’ll be able to entertain just as effortlessly as you would from the comforts of home. Of course, Mai Tai Charters offers one thing that dry land simply can’t: a front-row seat to some of the city’s best views. Our top decks are designed to give 48 people the experience of a lifetime, and you’ll be able to soak up the splendor with bench seating and a sun-protected intimate area. You can even give your trip an adventurous flair thanks to the boat’s swim deck and snorkeling equipment or go the full thrill-seeking route with a jet-ski ride. However you want to spend your time on the Adventuress, we’ll make it happen. Whether you’re planning a Private Party, Corporate Event, Whale Watching, planning your dream wedding or just want to take your extended family on a trip they’ll never forget, Mai Tai Charters is your ticket to paradise.